How to Become a Software Developer? GUI Application: * Catch the Button! Lab: GUI App "Currency Converter"
Lab: GUI App "Point in Rectangle"
What We Learned in This Chapter? As it has already been said, in order to program we need an Integrated Development Environment (IDE). This is actually an editor for programs, in which we write the program code and we can compile it and run it to see the errors, fix them and start the program again. For programming with C# we use Visual Studio IDE for Windows operating system and MonoDevelop or Raider for Linux or Mac OS X. If we program with Java, the environments IntelliJ IDEA, Eclipse or NetBeans are suitable. If we write in Python, we can use the PyCharm environment. Watch a video lesson about how to install and run the Visual Studio IDE: https://youtu.be/6AhALTJEagA. 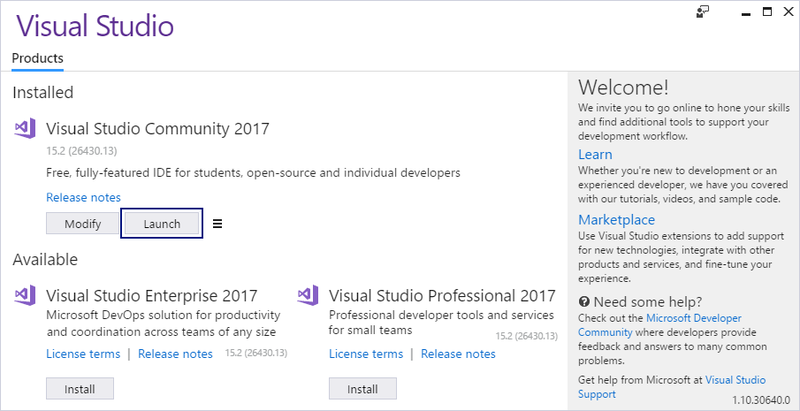 We begin with the installation of the integrated environment Microsoft Visual Studio (Community, version 2017, latest as of June 2017). 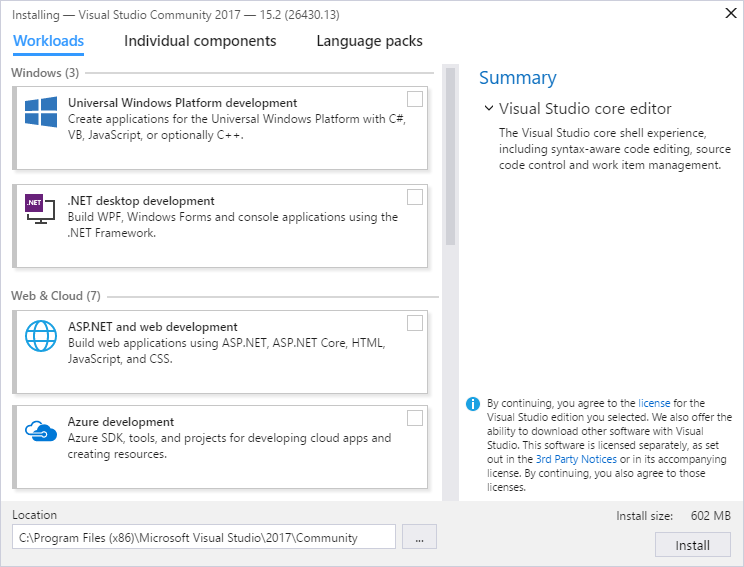 The Community version of Visual Studio (VS) is distributed freely by Microsoft and can be downloaded from: https://www.visualstudio.com/vs/community. 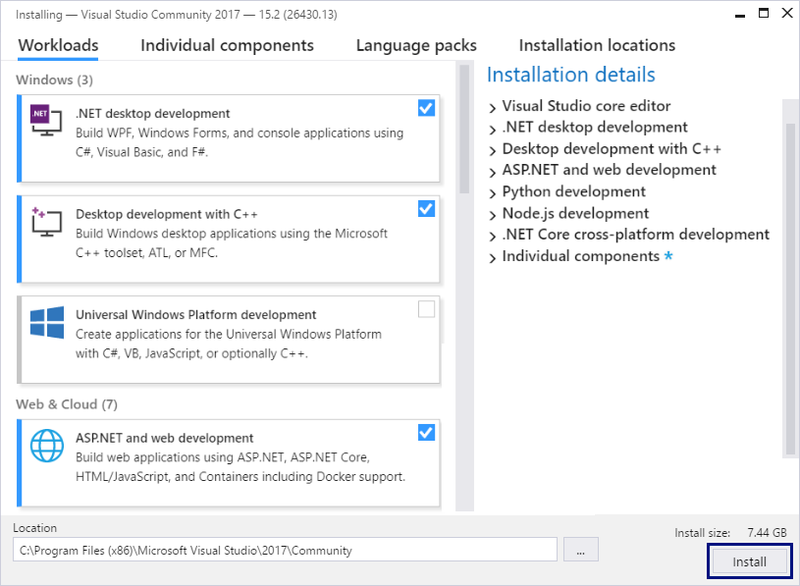 The installation is typical for Windows with [Next], [Next] and [Finish], but it&apos;s important to include the components for "desktop development" and "ASP.NET". It is not necessary to change the rest of the settings for the installation. A screen with the installation panel of Visual Studio is being loaded. 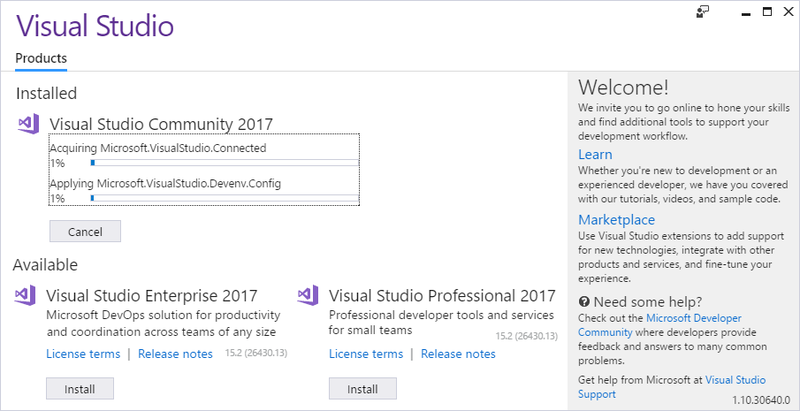 Put a check mark on [Universal Windows Platform development], [.NET desktop development] and [ASP.NET and web development], then press the [Install] button. Basically, this is everything. The installation of Visual Studio begins, and a screen like the one bellow will appear: After Visual Studio is installed, an informative screen will appear. Press the [Launch] button to start it. Upon starting VS a screen appears like the one bellow. 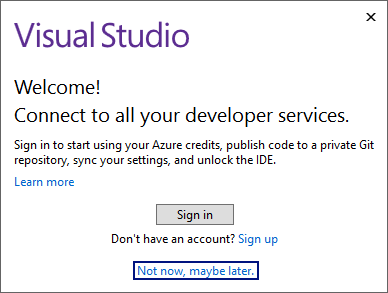 On it you can choose whether you will enter Visual Studio using a Microsoft account. For now, we choose to continue without being logged into our Microsoft account, and therefore we choose the option [Not now, maybe later.]. At a later point, if you have such an account, you may log in, and if you don&apos;t have one, and you have difficulties with its creation, you can always write in the forum of SoftUni: https://softuni.bg/forum. 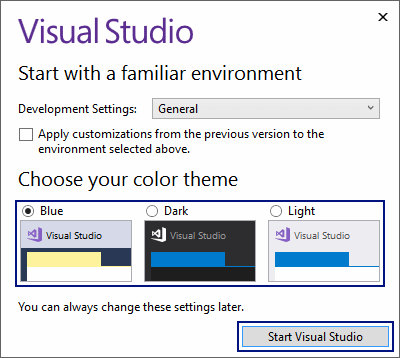 The next step is to choose the color theme, in which Visual Studio is visualized. The choice here lays completely on the preferences of the user and it doesn&apos;t matter which option will be chosen. 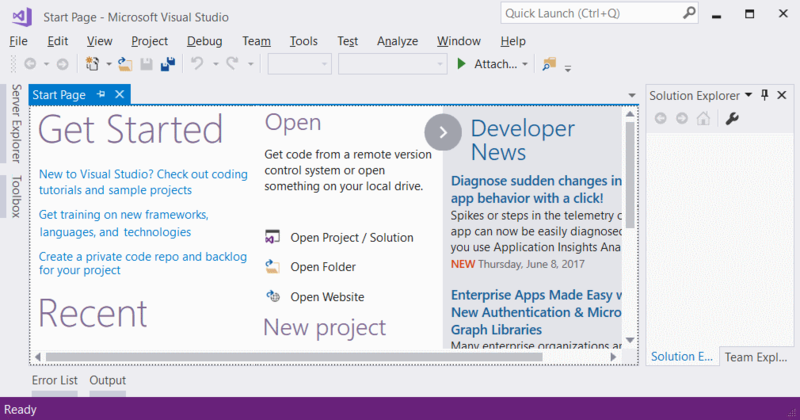 Press the [Start Visual Studio] button and the main view of Visual Studio Community will be displayed: That&apos;s all. We are ready to work with Visual Studio. You can use older versions of Visual Studio (for example version 2015 or 2013 or even 2010 or 2005), but it is not recommended, as they don&apos;t contain some of the newer options for development, and not all the examples from the book will run the same way. For the language C# the site .NET Fiddle allows code writing and its execution online: https://dotnetfiddle.net. For Java you can use the following online Java IDE: https://www.compilejava.net. The site Repl.it provides online coding environment for multiple languages (C#, Java, JS, Python, C++ and many more): https://repl.it. Before we start working with Visual Studio, it is necessary to get familiar with the concepts of a Visual Studio Solution and a Visual Studio Project, which are an inevitable part of it. Visual Studio Project represents "the project" we are working on. In the beginning, these will be our console applications, which we are going to learn writing with the help of the current book, the resources in it and the course Programming Basics in SoftUni. With deeper learning, time and practice, these projects will move into the direction of desktop applications, web applications and other developments. A project in VS logically groups multiple files constructing a given application or a component. 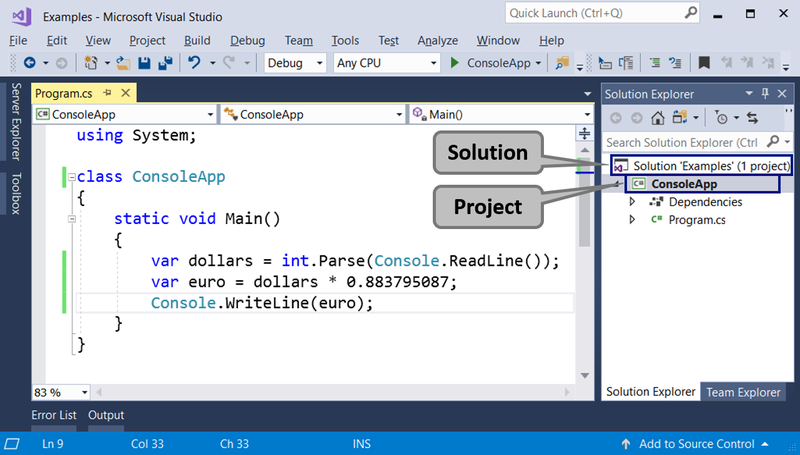 A C# project contains one or more C# source files, configuration files and other resources. In every C# source file, there is one or more definition of types (classes or other definitions). In the classes there are methods (actions), and they contain a sequence of commands. It sounds complicated, but with bigger projects a structure like this one is very convenient and allows good organization of the work files. Visual Studio Solution represents a container (a work solution), in which a few projects are logically bound. The purpose of the binding of these VS Projects is to create an opportunity for the code from any of the projects to collaborate with the code from the rest of the VS projects, to ensure the application or the website to work correctly. When the software product or service that we develop is big, it is built as a VS Solution, and this Solution is split into projects (VS Projects) and inside each project there are folders with source files. This hierarchical organization is much more convenient with more serious projects (let&apos;s say over 50 000 lines of code). For smaller projects VS Solutions and VS Projects are complicating the work, rather than helping, but you will get used to it quickly.